This tutorial will enable you to create an elegant accessory in autumn shades which will brighten up your working day and the lengthening evenings. A glass flower on the lapel of a coat or even a regular T-shirt will turn even the most commonplace clothing into an original. Imagination knows no bounds. 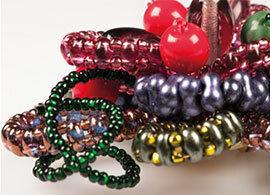 Try various color combinations and the variability of the shapes of the beads and seed beads from the Preciosa Traditional Czech Beads brand. 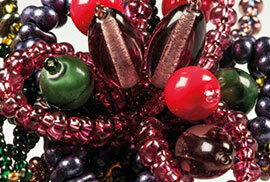 We wish you many creative ideas when working with all the many types of Czech beads and seed beads. 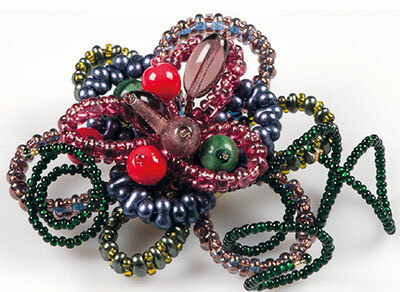 Twelve loops strung onto the wire will be attached to the brooch. The center will be filled with "antennae" with pressed shapes strung onto the nylon line. The green spirals will be strung onto the crimped wire. Divide the sieve into six segments of the same size (they can be marked using an indelible marker). Start filling the sieve from the edge. First create the green loops with oval arches. Cut two wires at a length of 16cm. Connect a securing loop to both of them. On one wire, alternately string the rocailles and Twins (fifteen 10/0 R and fourteen T). After completing the stringing, create a second loop on the wire. Use the second wire to string the rocailles between the second holes of the Twins (fifteen 10/0 R and fourteen T). Create a loop. Cut the loops off the wires. Remove the last rocailles from the outer wire. Fill the edge of the segments with the loop. Thread the wire through the four openings lying next to one another. Twist the wire at the back and adjust the loop. Use the flat nose pliers to twist it. Shorten the twist to 0.5-0.7 mm and press it in to the sieve. Add another two green loops to every second segment. 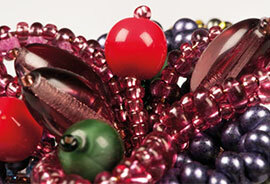 Create purple-brown loops for the empty segments as much as possible up to the edge. Proceed in the same way as for the green loops. Shape the arches in a circle. Alternately string nineteen 10/0 R and eighteen T. Thread the ends of the loops into the sieve further from each other than in the case of the green ones, with a small gap between them. String the outer wires onto the lines dividing the individual segments. Now add the loops made of Farfalles. Cut off 16cm from the wire and create a securing loop. Pass the lines through two openings in the sieve directly above the green loops. Twist the wire from the back again and then cut it off and press it in. Add the dark pink (fuchsia) loops last. 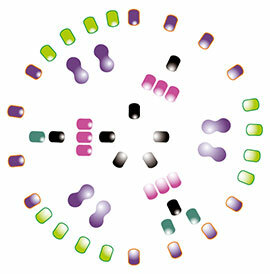 Create them almost at the tops of the segments; in the same segments as the ones with the purple-brown loops. Alternately string fifteen 10/0 R and fourteen T onto a wire. Shape the arches into ovals. Twist them more into space. Thread it through three openings. Only use one opening to thread the internal wire. Sew the "antennae" onto the center of the sieve and between the ends of the fuchsia loops. Tie the nylon line to the sieve. The knot and the short end are located at the back. Pass through the sieve to the front. 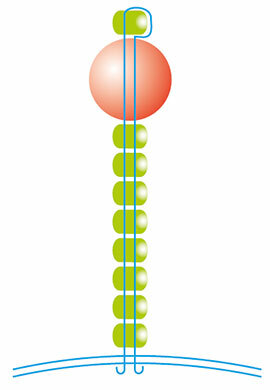 String eight R (10/0 08298 or 11/0 57150), a ball and one R next to the "antennae" with the 8mm balls (three red, two green). Return to the 8mm ball and to the eight R. Also thread it through the opening. Come up from the back in the next hole and you can then start sewing on another "antenna". String 6x 10/0 R (purple with a copper lining), an olive and 1x 10/0 R next to the "antenna" with the olive (three). Go back into the olive and to the bottom six 10/0 R. They are not regularly sewn--as such, you can arrange them as you wish. 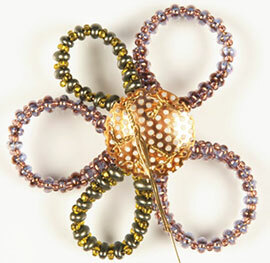 Attach the green spirals on the crimped wire between the ends of the two purple-brown loops. Cut off 15-20cm of wire. Crimp it--pass the edge of the scissors, a ruler over it along the edge of the table. Be careful not to scratch it! 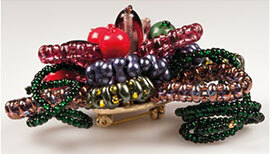 String the metal crimp bead and one glass rocaille onto the crimped end. 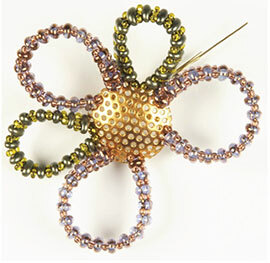 Return to the crimp bead and squeeze it using the flat nose pliers. String the R onto the crimped section from the other end. Also hide the "end" from the metal crimp bead in it. Attach one green spiral to the left-hand loop and two to the right-hand one. Thread the line through the hole in the sieve and crimp the metal crimping bead on the wire from behind. Cut off the wire about 0.5cm from the sieve. Attach the decorated sieve to the brooch base. Glue it (using hot melt adhesive or a two component adhesive) or fold over the metal prongs. Use the pointed implement (the end of the scissors, the closed end of the pliers) to press the prongs to the sieve. This can also be modified or shortened.